A fully revised edition of the book architects and developers consider the bible of hotel design. Hotel Design, Planning, and Development, Second Edition, is a thorough overview of the important and fast-growing hospitality industry. It is revised and expanded from the previous edition—the “bible” for designers, developers, planners, and students. This edition, updated to include significant hotels developed internationally in the last ten years, outlines essential planning and design considerations based on the latest data, supported by technical information, 60 Line drawings, 59 Tables, 429 full-color images, and many original floor plans. 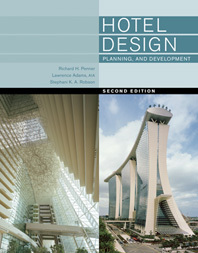 The authors describe and illustrate different types of hotels, at different locations—downtown, suburban, airport, roadside—with different mixes of facilities—casino hotels, convention hotels, conference centers—and provide analysis and theory to support each of the major trends, highlighting how the designers’ work fits into the industry’s development as a whole. They give increased attention to interior design psychology and the design process. The design guide includes specific information on space allocation programs and details on planning public areas, guestrooms and suites, and back-of-house facilities, as well as the newest developments in design practice and software. Extensive case studies showing best practice examples of hotel design demonstrate how a successful new concept is developed. Contributions from key figures in the profession, such as Ian Schrager and John Portman, illuminate the text. Hotel Design, Planning, and Development, Second Edition, is the primary resource for students of design and hotel management and an essential reference for all those actively involved with hotels. Sales Territory: USA and Dependencies, Philippines, Canada, Mexico, Central America, South America and the Caribbean.